Otters are one of the most beloved of semi-aquatic mammals, but are often mistaken for beavers. Otters can be found in many different types of climates all over the world as long as there is water for them to swim and hunt in. Due to recent findings in fossil records, it is now known that otters have been a successful species on this planet for more than 30 million years. However, even though the otter is a resilient little creature, certain populations of them are becoming endangered due to pollution of smaller bodies of water and destruction of natural forest land where they make their homes. This makes Otter Removal a very touchy subject. Otter removal can be challenging, especially because of how agile and adept they are at maneuvering through the water. No matter the nuisance animal, people are determined to try chemical and holistic remedies to their wildlife problems. Otter control stems from pepper-based soil additives to Listerine bombs. Yes, Listerine bombs. The theory behind these is that the potent aroma and flavor will prevent otters from eating certain vegetation. It sounds good, right? 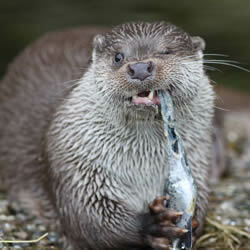 Well, if the source of food for otters wasn’t primarily found in the water, maybe Listerine would stand a chance. In other words, don’t waste your time. On par with other semiaquatic species, poisoning is not recommended, and there is no approved poison for otters. Otters are extremely intelligent and playful, and their curious nature makes them naturally resistant to decoys and urine deterrents. An otter is more likely to investigate a fake predator statue than run away from it. What areas do we provide our Louisiana Otter removal service? Trapper J, a North Louisiana Nuisance Wildlife Otter Removal specialist is the most professional and humane nuisance wildlife control service available in Monroe, West Monroe, Ruston, Bastrop, Alexandria, and Pineville in the North and Central Louisiana area.